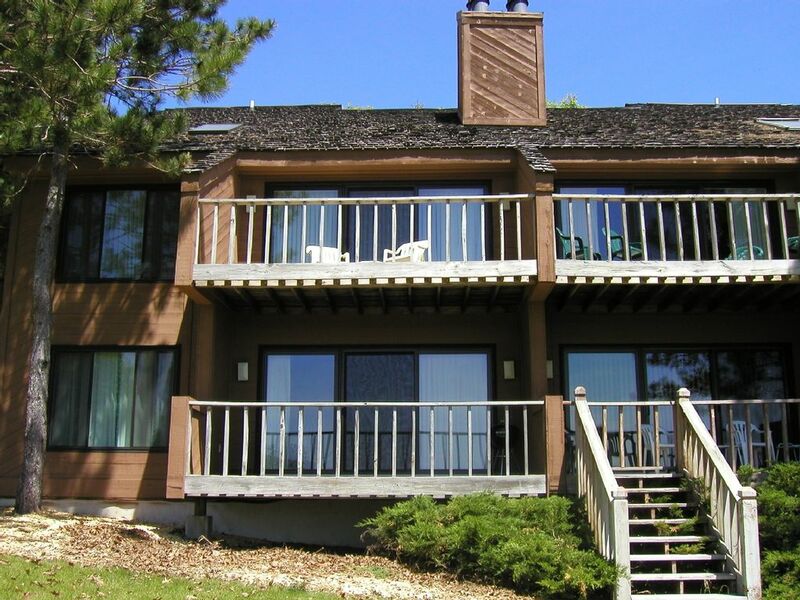 This Trappers condo is perfect for your golf or ski vacation. The location cannot be beat! You have a view no matter where you look. 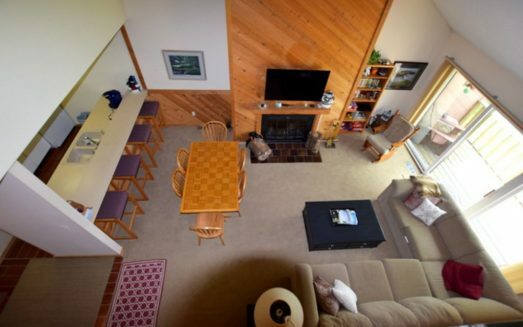 Stand on the back deck and watch all the action on the Summit slopes. Walk to the Legend or Summit golf course and the Summit slopes in winter. 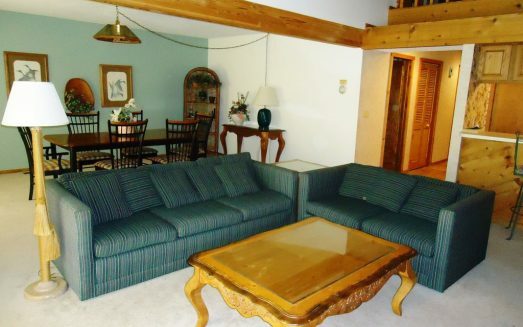 There is room enough for large groups or for a small group that wants just a little more room. 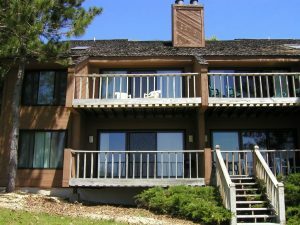 The large open living/dining area with a full wall stone fireplace and a doorway to a deck open into the kitchen – which has been updated with all new appliances, new counter tops and has everything you need to cook a meal – or order in or hit the local restaurants. There is a washer and dryer in the unit. You’ll also find a large walk in shower in the first floor bath. You also get to use the private Beach Club on Lake Bellaire in the summer and the pool at Summit all year round! 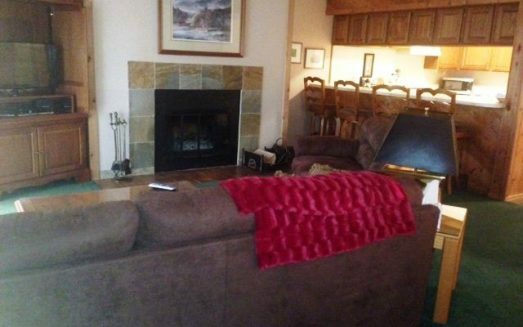 The condo has cable and internet access. Shanty Creek – Spring, Summer and Fall: Shanty Creek resort offers 72 holes on four championship golf courses, each combining challenging play with Up North natural beauty. The courses offer tight fairways, formidable doglegs, breathtaking hazards, and varying elevations, Shanty Creek’s golf courses put golfers in an enviable position—trying to read and play those challenging greens amid the stunning views. Golf Tom Weiskopf designed Cedar River Course, Arnold Palmers, The Legend, the Schuss Mountain course – a favorite among locals who annually name it one of the top public courses in Michigan and Shanty Creeks original course – the Summit. You will also have access to the private beach club on Lake Bellaire. What to do outside the resort? : Golf 4 wonderful courses, swim, boat, use the pools and hot tubs, sightsee – you’ll run out of time before you run out of things to do. Please enjoy the resort restaurants and shopping, and visit the great places in Bellaire. There is a movie theatre, video store, grocery store, some cool shops, coffee shops (Moka) and restaurants. One of our favorites is Starlight – and don’t miss out on a visit to Shorts. 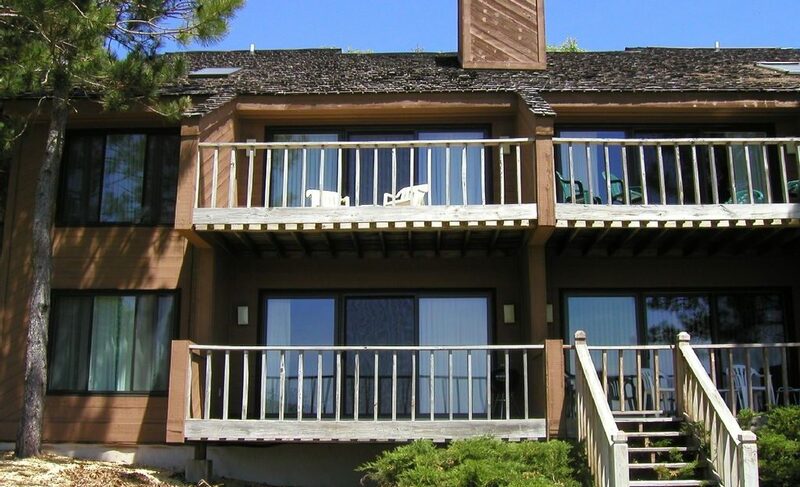 In the resort, try Lakeview – it really does have a fantastic view of Lake Bellaire, or Ivan’s over at Schuss Village. If you get a chance to go a little further, Dockside on Torch Lake is a fun place to eat with a great setting on the lake. A few more miles will get you to Alden (don’t miss Higgins for the best ice cream around), or Traverse City, Petoskey and Charlevoix. Wonderful location for summer & winter fun!